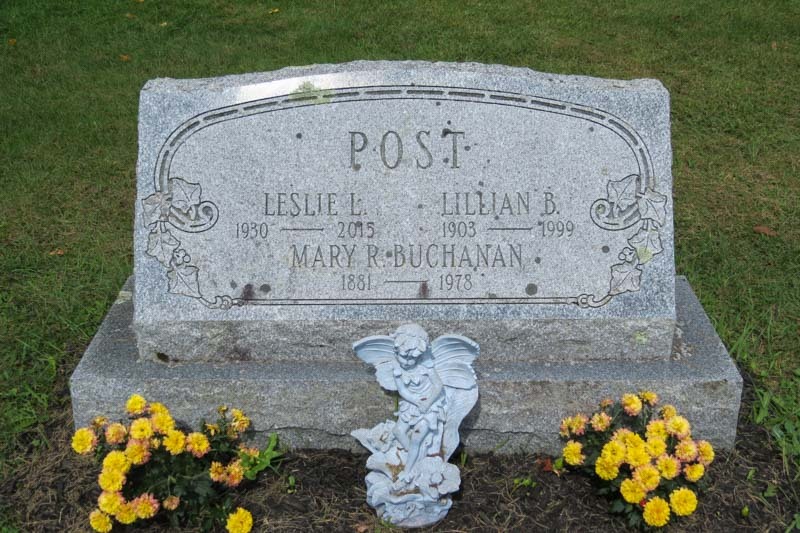 Last Saturday, September 24, 2016, family and friends gathered on a hillside in Peacham, Vermont to honor Leslie L. Post and commit his body back to the earth. I shared about the memorial service on my personal blog, Inspired By June. On a more personal note, here on Dad's blog, I offer the words that Pastor Lee read on my behalf at the service. How do you condense 84 years of life into a few paragraphs? It’s a challenge not easily won. By the time I met my dad he had already lived nearly half his life. By the time I was old enough to relate to him, his years in Germany, and time as a brick mason, antique dealer and mail carrier in New Jersey were only memories. Vermont had called him to a slower pace and Peacham seemed like the perfect place to run a farm and raise a family. And for twenty odd years, he did exactly that. My dad was a hardworking, honest man. He wasn’t perfect, but he was true and, surprisingly, humble. He loved people and their stories. Over the years he amassed a collection of photographs and histories of over 100 families. When I was younger I believed my dad knew everything. As I grew older I realized that wasn’t true. But he still knew more than most and if he’d known you for very long he probably knew more about your family’s history that you knew yourself. Dad loved the farm, the town of Peacham, and her people. It didn’t occur to me at the time but leaving everything he loved and starting over at age 67 must have been extremely difficult for him. It wasn’t the last time he’d be starting over and I’m sure he never expected to take his last breath in a little town in Texas. Life’s funny that way. We can plan and dream but none of us know what the future holds. But we can know Who holds the future. Dad knew. And I believe that is where his strength came from. Dad didn’t vocalize much about his faith. He wore it quietly in his weekly church attendance, daily prayer and a well-worn bible. But there were times when he did proclaim his faith. First in the back of a little book entitled Strength for Service to God and Country, in 1951 and then again on a mid-December night in a pool in Fountain Hills, Arizona when I had the privilege of standing beside him as we both re affirmed our allegiance to our Lord and Savior, Jesus Christ. Losing dad was one of the hardest things I’ve ever experienced. I miss him every day. But my hope is sure. I know where he is and Who he’s with. And in eternity together we will be.